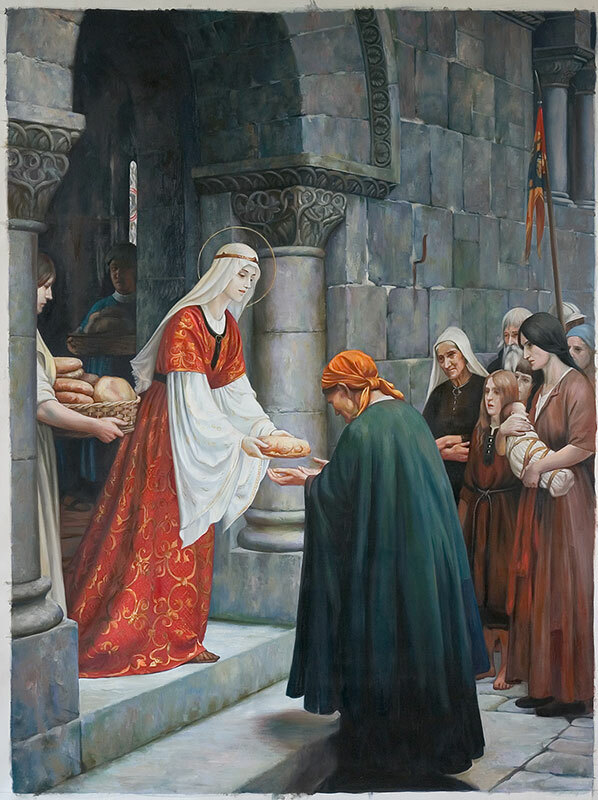 Elizabeth of Hungary was born on July 7, 1207, in the Kingdom of Hungary. She was a princess, the daughter of King Andrew II of Hungary and Gertrude of Merania. She was a greatly venerated Catholic. She died on November 17, 1231 at the age of 24. St. Elizabeth was brought to the court of the rulers of Thuringia in central Germany, to become betrothed to Louis IV, (also known as Ludwig IV) a future union which would reinforce political alliances between the families. She was married at the age of 14, and widowed at 24. After her husband’s death she sent her children away and regained her dowry, using the money to build a hospital where she herself served the sick. She became a symbol of Christian charity after her death at the age of 24 and was quickly canonized. The marriage appears to have been happy. After her marriage, she continued her charitable practices, which included spinning wool for the clothing of the poor. In 1223, Franciscan friars arrived, and the teenage Elizabeth not only learned about the ideals of Francis of Assisi, but started to live them. Louis her husband was not upset by his wife’s charitable efforts, believing that the distribution of his wealth to the poor would bring eternal reward; he is venerated in Thuringia as a saint, though he was never canonized by the Church. It was also about this time that the priest and later inquisitor Konrad von Marburg gained considerable influence over Elizabeth when he was appointed as her confessor. 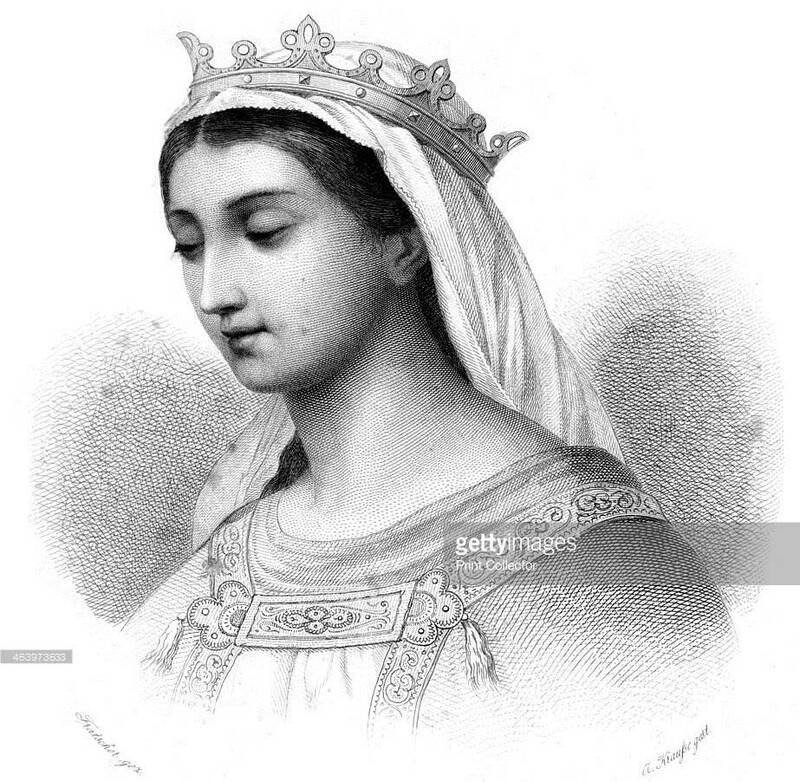 Elizabeth’s life changed irrevocably on 11 September 1227 when Louis her husband, en route to join the Sixth Crusade, died of a fever in Italy. On hearing the news of her husband’s death, Elizabeth is reported to have said, “He is dead. He is dead. It is to me as if the whole world died today. His remains were returned to Elizabeth in 1228. Following her husband’s death, Elizabeth made solemn vows to Konrad similar to those of a nun. These vows included celibacy, as well as complete obedience to Konrad as her confessor and spiritual director. Konrad’s treatment of Elizabeth was extremely harsh, and he held her to standards of behavior which were almost impossible to meet. Among the punishments he is alleged to have ordered were physical beatings; he also ordered her to send away her three children. Her pledge to celibacy proved a hindrance to her family’s political ambitions. Elizabeth was more or less held hostage at Pottenstein, Bavaria, the castle of her uncle, Bishop Ekbert of Bamberg, in an effort to force her to remarry. Elizabeth, however, held fast to her vow, even threatening to cut off her own nose so that no man would find her attractive enough to marry. She then built a hospital at Marburg for the poor and the sick with the money from her dowry, where she and her companions cared for them. Her official biography written as part of the canonization process describes how she ministered to the sick and continued to give money to the poor. She was canonized by Pope Gregory IX. The papal bull declaring her a saint is on display in Vienna, Austria. Her body was laid in a magnificent golden shrine—still to be seen today—in the Elisabeth Church (Marburg). It is now a Protestant church, but has spaces set aside for Catholic worship. Marburg became a center of the Teutonic Order, which adopted St. Elizabeth as its secondary patroness. The Order remained in Marburg until its official dissolution by Napoleon I of France in 1803. From her support of the friars sent to Thuringia, she was made known to the founder, St.Francis of Assisi, who sent her a personal message of blessing shortly before his death in 1226. Upon her canonization she was declared the patron saint of the Third Order of St. Francis, an honor she shares with St.Louis IX of France. Elizabeth’s shrine became one of the main German centers of pilgrimage of the 14th century and early 15th century. Elizabeth is perhaps best known for her miracle of the roses which says that whilst she was taking bread to the poor in secret, she met her husband Ludwig on a hunting party, who, in order to quell suspicions of the gentry that she was stealing treasure from the castle, asked her to reveal what was hidden under her cloak. In that moment, her cloak fell open and a vision of white and red roses could be seen, which proved to Ludwig that God’s protecting hand was at work.. Hers is the first of many miracles that associate Christian saints with roses, and is the most frequently depicted in the saint’s iconography.